Want to learn the ukulele? We'd be happy to have you join one of our Uke 101 workshops! The Allegheny Ukes perform for groups all over! 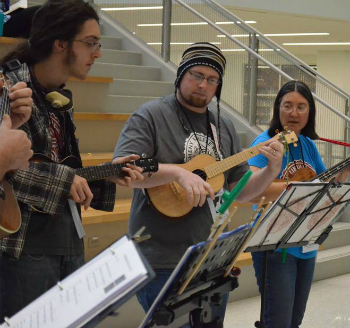 The Allegheny Ukulele Kollective (or Allegheny Ukes) is a Ukulele enthusiast club based in the Altoona-State College, PA region. The Allegheny Ukes have existed in various incarnations since 2010 where we jammed on college campuses, the local YMCA, and in cafes. We welcome players of all abilities and of all ages! We get together nearly every week on the first - fourth Sunday of the month. Check our calendar of events to see where the next jam or event will be! New to the ukulele? Never picked one up but want to try? Come on down and join us! We're always sure to bring extra ukes to our jams for just such an occasion.